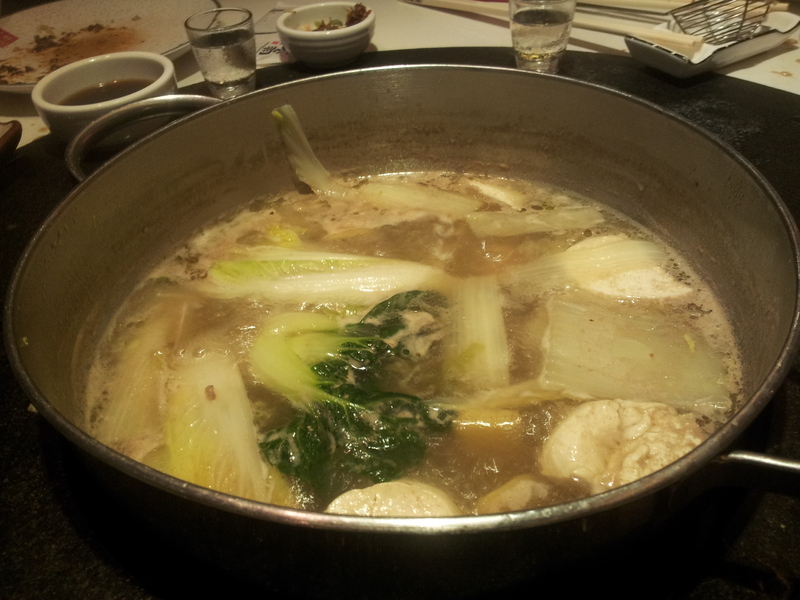 The beef hotpot at Budaoweng(不倒翁) is favourite with my wife Lisa (& with me too!). Everytime she is in Hong Kong. she will go for a late supper (宵夜-there is a 40% discount after 9.30pm during weekdays & after 9.45pm during weekends), sometimes twice during her stay. This time is no exception. During our recent trip to Hong Kong, we arrived & checked-in to Marco Polo Prince Hotel about 8.15pm, so timing was quite perfect. 不倒翁 was just a short walk to iSquare and there was no need to pre-book. We did this again on the evening of 11.3.2013, before flying back Singapore the next day. 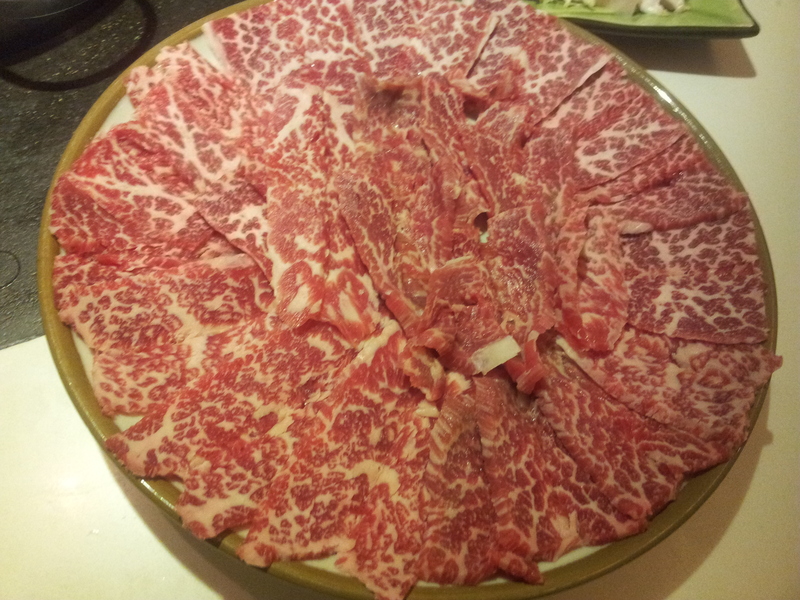 We ordered the usual large portion of specially selected handcut US angus marbled beef (特选手切肥牛)- HK$168 after 40% discount. 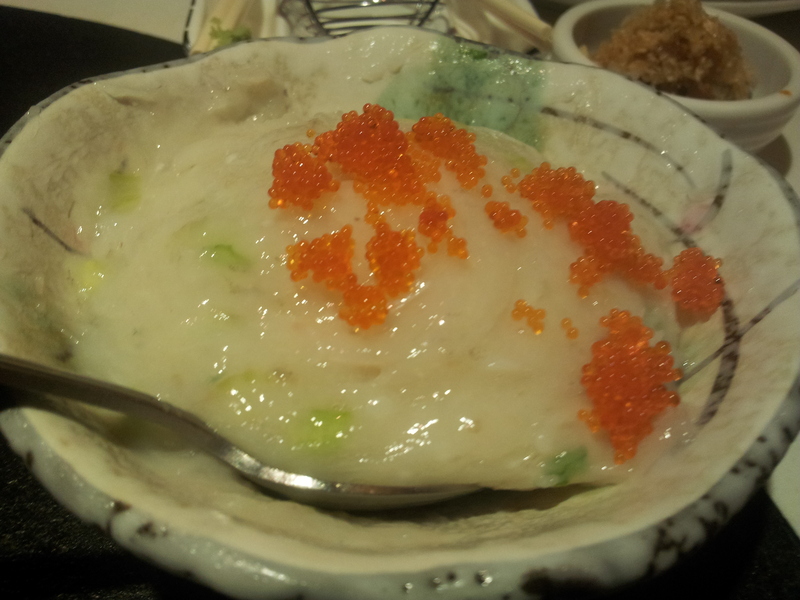 You can see the marbling, and this is really flavourful & tender, melting in the mouth. I thoroughly enjoyed this even though we ate exactly the same thing the second visit. Both times we were greedy and ordered another small portion of beef – HK$138 after 40% discount. Our daughter Su Lin was with us, so there were 3 of us. I could just eat the beef & vegetables and nothing else. 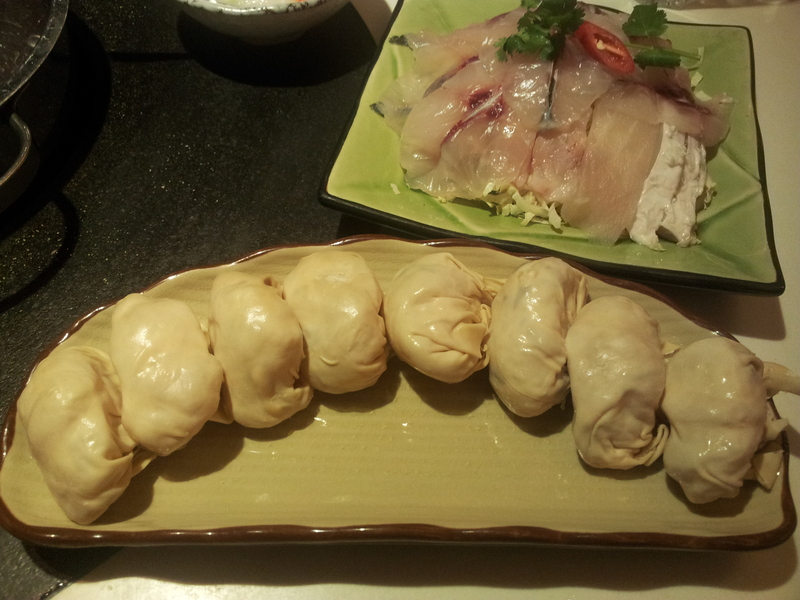 We also ordered a plate of prawn dumplings – 8 for HK$58. You could also order a 1/2plate – 4 dumplings for HK$30. This was really good too. Each dumpling had 3 very fresh large prawns, the skin was smooth, and it’s super tasty. 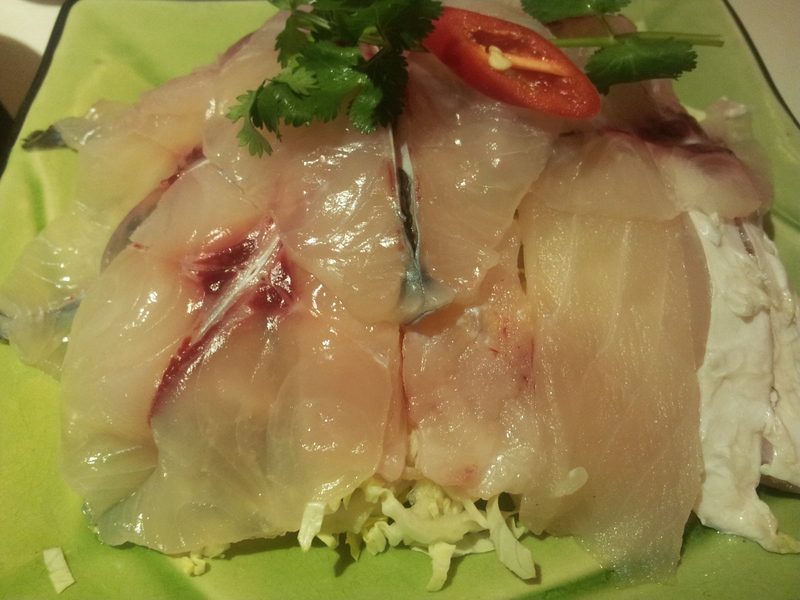 I also added a 脆鲩鱼骨腩 (grass carp bones & belly) – HK$38. I like fish so I quite enjoyed it, but though 脆 means crunchy, it can mean tough & also several pieces have bones, so not everyone will like. We did not order that the second time we visited. Lisa also ordered a prawn paste (虾滑) – HK$58 – which is nice too, though we don’t really need to have that, and we did not order it the second time we visited. We also had the vegetable basket. I cannot remember the price but it should be like HK$88 of HK$108. You must have vegetables for balance for a meat steamboat and Hong Kong vegetables are fresh & nice. 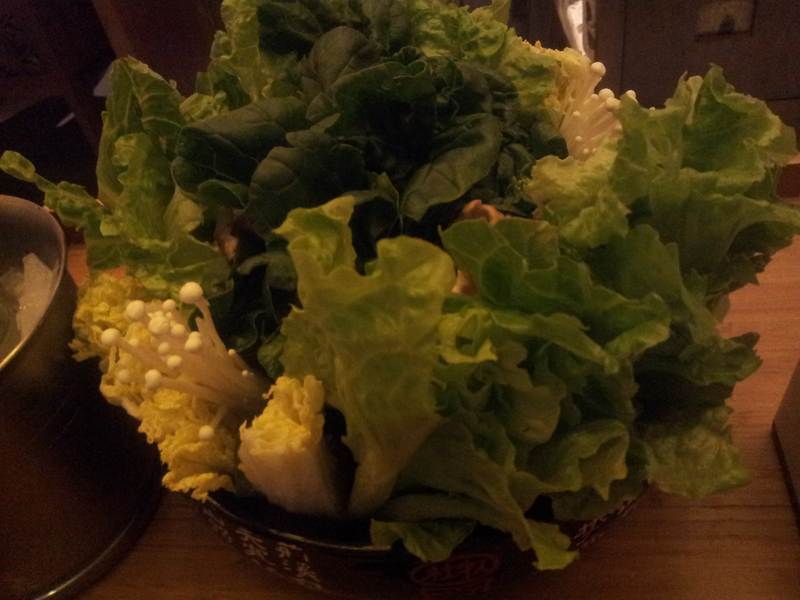 On the second visit though we ordered just the Chinese lettuce for HK$48 & that was really quite sufficient. There was a wide range of hotpot soup base, but since we went there primarily to take the beef, we opted for the cheapest HK$88 clear vegetable soup. 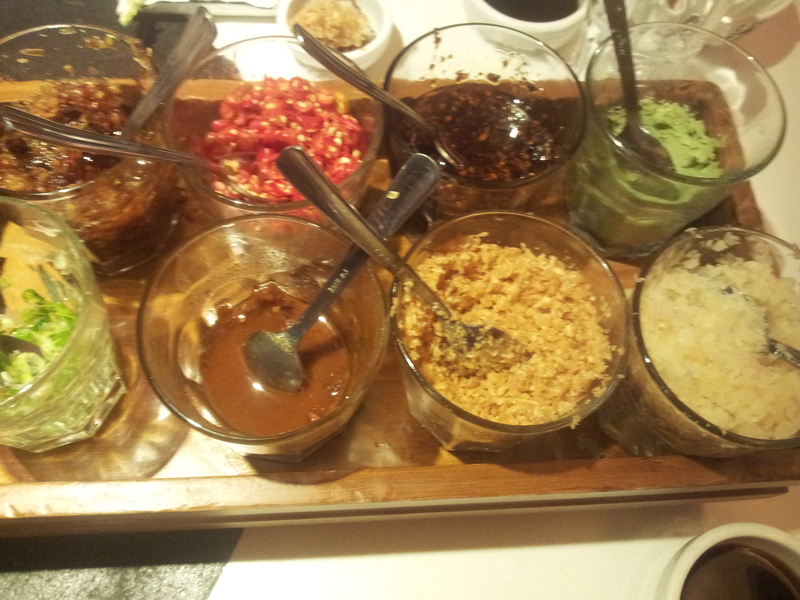 There was also a HK$20pax charge for the condiments (调料) – haebeehiam, garlic, spring onions, chilli, chilli oil, wasabi, soy sauce etc (most hotpot restaurants in Hong Kong charged this also). The entire meal, if you were to say order for 2pax 1 plate of beef, 1 plate dumpling & 1 Chinese lettuce + the plain soup base, it will set you back by HK$442 (inclusive of HK$20pax for the condiments & 10% service on top), and if you add a bottle of 350ml sake, that will be another HK$300+, so it is not really that cheap even after 40% discount. But to me the food quality & the enjoyment of it is well worth the price! Service is efficient, and they will bring hot water & ice, which are free (they don’t serve cold water only mineral water, I did not check the price but it should be ok to order it if you need to have mineral water..), we don’t really have any complaint about that. This entry was posted in Buon Appetito! and tagged angus, beef, budaoweng, Hong Kong, hotpot, isquare, tsimshatsui. Bookmark the permalink.